The holidays are a busy time of year. It's tough to eat healthy, get in those workouts, and stay on budget. Keeping your bank account in a good place is especially challenging when shopping for Christmas presents or other holiday gifts for friends, family, coworkers and employees. It's so easy to overspend, or spend on items that aren't so healthy. That's why I've compiled a list of affordable cheap Christmas gift ideas for those picky fitness enthusiasts in your life. And you can get them all delivered to your home quickly and affordably to make things more convenient. Enjoy! When it comes to personalised Christmas gifts, a clock might not be the first thing that comes to mind. But when you have the opportunity to get a customized clock for your recipient's gym or home gym, it makes much more sense. If the person you're giving a gift to is really into fitness they might even put it in their bedroom! It's a great reminder that it's always time for fitness! If you're looking for Christmas gifts for Mums that love fitness or that athletic man in your life, look no further than Tagital affordable fitness tracking smart band watches. Why buy a FitBit or Smart Watch for hundreds of dollars when you can get a great fitness tracker for just pennies on the dollar. This smart fit band does everything from pedometer, sleeping, heart rate, bluetooth, and of course time. Want to give a unique gift that is practical, affordable and fun? Look no further than a dumbbell-shaped water bottle! I've never seen anything like this and I know I need to buy one for myself immediately. And the price is the same amount or cheaper than a regular water bottle! Enjoy free shipping for Amazon Prime members as well so you can make sure Santa delivers it in time for Christmas morning. Give the frugal gift of health and fitness this year at none other than my favorite store: The Dollar Tree! Why? Because EVERYTHING is only $1! They have a decent amount of health and fitness products available at their physical stores, but an absolutely amazing selection on their website! From jump ropes to bands and vitamins, there is a wide variety of cheap healthy Christmas gifts for everyone on your list. What could be more discreet and effective than a treadmill desk or a physioball to create a healthier workstation? An under desk elliptical of course! It's also a much more affordable and realistic option than an actual piece of cardiovascular workout equipment like a treadmill or treadmill desk. This great gift helps to keep your family, friends and co-workers healthy, fit, and motivated. Healthy employees and family members are happier and more productive too! The prices for under desk ellipticals start at around $70. Give the gift of golf and laughs with great t-shirts from Golf Crowd! These hilarious tees will keep your friends, family and coworkers smiling year round on and off the green. And shipping is extra quick if you live in the UK! 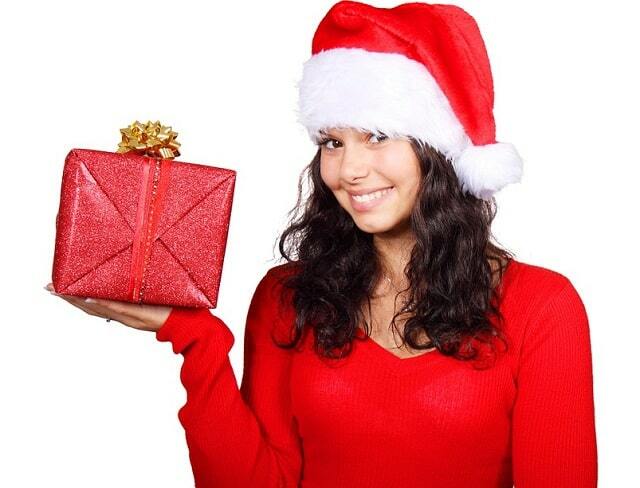 Don't forget about the great gifts you can find right here on Frugal Fitness! Like my website name implies, the prices are quite frugal for my fit ebooks, paperback books, and fitness apparel! Christmas doesn't have to be filled with unhealthy gifts and expensive presents that annihilate your bank account. Give these gifts and your bank balance and waistline will thank you! Merry Christmas, Happy Holidays and Happy New Year my frugal fitness friends and fans! I hope you enjoyed this blog post about cheap but healthy Christmas and holiday gift giving ideas to stay on a frugal budget. Interested in more articles about frugal holiday gift giving?